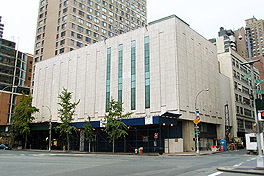 The Manhattan New York Temple is the 119th operating temple of The Church of Jesus Christ of Latter-day Saints. The opening of a temple in Manhattan, New York was announced on August 7, 2002. A few months before on March 24, 2002 at a special regional conference in New York City, Mormon Church President Gordon B. Hinckley told those in attendance that he expected a temple to be built in the area in the next two years. The Church wide announcement made on August 7th fulfilled this expectation. The need for a temple in the Manhattan area became apparent during the last decade when Mormon membership tripled to more than 42,000 members. A groundbreaking ceremony and site dedication were held on September 23, 2002 with construction beginning soon after. The Church had decided to adapt an existing building, which stands across from the Lincoln Center, owned by the Church into the temple. This was done because costs for land in the area were extremely high and the leaders of the Church did not feel it was practical to buy land to build another structure. This was not the first time that this decision had been reached. A similar situation existed in Hong Kong where the Church opted to build the temple within an existing building. The original Manhattan building was constructed in 1976 and the building still houses a family history center and public affairs office on the third floor and a stake center on the fourth floor. The temple is located on the first, second, fifth, and sixth floors of the building. The insides of these floors were completely renovated. The walls were made to be sound proof so that the noise of the traffic outside would not interrupt the spiritual reverence in the temple. The total floor area for the temple part of the building is 20,630 square feet and the temple houses two ordinance rooms and two sealing rooms, along with a baptismal font. Inside the temple beehives are carved into the molding and door handles that look like the statue of liberty torch are found throughout. There are also beautiful paintings on the walls of many of the rooms that depict beautiful scenes in nature. On June 12, 2004 a cultural celebration was held at the Radio City Music Hall entitled "A Standard to the Nations." It was a two-hour performance including more than 2,400 Mormon youth from the area. President Hinckley officially dedicated the Manhattan New York Temple for use on June 13, 2004. After the dedication a special ceremony was held and a time capsule was put in the cornerstone with memorabilia from New York such as a copy of the New York Times and memorabilia from the Mormon Church such as a set of scriptures, a handkerchief used during the dedication ceremony, and sheet music. Just before the temple dedication it was announced that a steeple and statue of the angel Moroni would be added to the building in the fall. On October 9, 2004 thousands of people came to watch the ten-foot statue be placed on top of the steeple. "Mormon president calls new temple in New York 'Zion in Babylon'". Associated Press, USA. June 19, 2004. This page was last edited on 1 October 2010, at 01:09.